Inspiration Art & Education was incorporated to impart quality education to students preparing for various competitive examinations for Architecture, Design & Art, with the sky-high ideals and commitment to excellence. 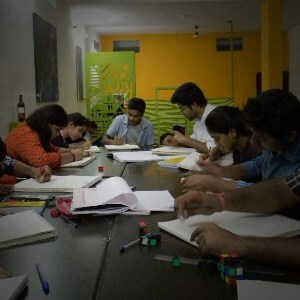 Now Inspiration Art & Education has taken a shape of vibrant, dynamic and responsible institute of the Rajasthan (India) in field of various architecture and design examination’s like NATA, NID, NIFT, UCEED, JEE (B.Arch). Roadmap of Institute is devoted to Student’s sustainable Success, Lifelong learning and Knowledge transferring, Respect, Integrity, Accuracy, Trust, Honesty and Ethical behavior. We are following a continuous quality improvement program to give value based learning to students. Today, Inspiration Art & Education stands apart and well above the rest on a distinguished platform as an epitome of success. This could be achieved simply by virtue of the excellent teaching methodology that Inspiration Art & Education has evolved, developed and implemented over the last eight years. We are improving day by day, an institute which was started at our home and growing with ethical values. Now Inspiration Art & Education has shaped up as best NATA coaching in Jaipur and in entire Rajasthan. Students from all locations of India, gives us a symbol of Best institute for NATA, NID, NIFT & UCEED in Jaipur, Rajasthan. Now our Alumni are part of top institutes of Architecture & Design. We are very grateful to our Students, Parents, Faculty members and other Stackholders for their valuable support to us. We will try to give our best for you in our every field of service. Your faith will encourage us every time to do big and unexpected for you.